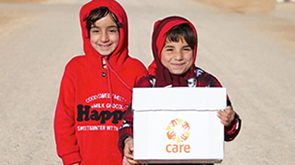 Put yourself in the shoes of an emergency aid worker this July and complete a 10km race for CARE International. Join our all-women Vietnam to Cambodia bike ride in 2019. The private sector has a critical role to play in reducing poverty. Partner with CARE to create better opportunities for everyone. Find out more about our events – from runs, cycles and treks, to overseas adventures – whatever you do, you'll challenge yourself, have fun, and help change lives! Find out how we partner with private sector companies to fight poverty. A Charity of the Year partnership with CARE is a fantastic way to motivate and unite your staff while helping raise funds and awareness for CARE’s vital work around the world. Use our resources and lesson plans for primary and secondary schools to explore issues of gender inequality – and make a positive impact with CARE. Fundraise with your church, Girl Guide group, Rotary, Women’s Institute – or any other community group you belong to. Thinking about holding your own fundraising event to support CARE’s vital poverty-fighting work? Take a look here for ideas, inspiration and advice. Getting involved as a volunteer is a great way to support CARE’s work. Leave a gift in your Will and continue to help families in need long into the future.